After 11 successful seasons with the Nashville Predators, Martin Erat decided it was time for a change and the reports indicate that he requested a trade twice from Nashville to a contender during the 2012-13 NHL season. The reason for his requesting to move on from the only team he knew was his belief that they would not be a cup contender after missing the playoffs the season prior. During his time in Nashville Erat was very consistent in putting up points. From 2005-06 to 2011-12 he never posted a season of less than 49 points. He was also a valued member of the Predators power play unit providing 42 power play goals over his 11 seasons with the team. From the 2006-07 season on, he averaged between 18 and 20 minutes for the Predators, contributing consistent secondary scoring. 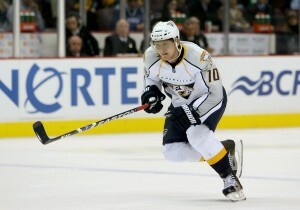 The majority of his last two seasons in Nashville he played on a line with Mike Fisher and Andre Kostitsyn. Nashville granted his request for a trade but both General Manager David Poile and then Head Coach Barry Trotz remained tight lipped about the particulars surrounding Erat’s trade request. Safe to say there seems to be a sense of bewilderment and perhaps some resentment boiling below the surface. In need of secondary scoring, the Washington Capitals worked out a deal with the Nashville Predators to facilitate the trade request. For a time Erat seemed happy to be with the Capitals and the expectation was that Washington should be a better team with him there. After being traded to the Capitals he saw ice time mainly with similar players that he did in Nashville. Himself, Mike Ribeiro and Troy Brouwer were to be the second line scoring depth that would help to change the Capitals playoff fortunes. However despite winning their fifth Southeast Division title in the past six seasons, Washington lost in the first round to the New York Rangers in seven games. During the next season Erat was not generally used as a top six forward, his most common line mates were Troy Brouwer and Joel Ward. Unfortunately things did not work out with the Captials and for the second time in two seasons, with two different teams, Erat requested a trade. During his 62 games with the Washington Capitals he contributed only two goals and 25 assists; however his ice time was down into the 15 minute ranger per game. 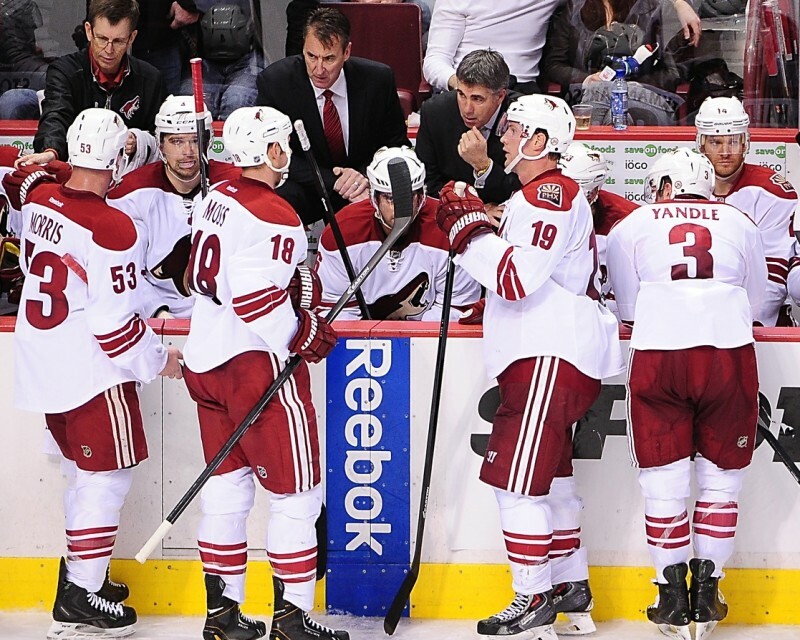 Eventually Capitals General Manager George McPhee was able to deal Erat to the Phoenix Coyotes. Martin Erat’s no movement clause enabled him to have some say in which team he would end up being traded to. He was happiest to go to Phoenix based on his past relationships with fellow Czech Republic natives Radim Vrbata, Martin Hanzal and Zbynek Michalek. After coming to the Phoenix Coyotes he mostly played on a line with fellow Czech’s Vrbata and Hanzal. However his average ice time was again down to the 14 minute range and he ended the season with two goals and three assists in 17 games in the desert. Will he regain his scoring touch? Throughout his 12 year NHL career his average shooting percentage has been 12.4%, however he has only averaged half that at 6.6% the past two seasons. The big question is whether the 32 year old forward is now in a consistent decline with his game, or if his shooting percentage will get near his career average again. If you take his average 109 shots per season and apply his average shooting percentage for his career he should be around 14 goals. If you base his goals on his play the past two seasons it would be seven goals. Has Martin Erat become a “lazy” player? His average shot distance when his play declined in Nashville prior to requesting a trade was 30.2 feet in 2011-12 and 28.3 feet in 2012-13. When he first arrived in Washington he appeared reinvigorated and his average shot distance decreased to 24 feet. However during last season it was clear that he was again unhappy averaging 27.9 feet for his shots for Washington. Once he was traded to the Phoenix Coyotes the average shot distance dropped, much like when he arrived in Washington, to 25 feet. The question is will Martin Erat remain happy and motivated with the Coyotes next season. The effect of Dave Tippett’s defensive system can be seen in Erat’s Corsi numbers. He was mostly below 45% prior to coming to the Coyotes and with Phoenix he was over 54% in 17 games played. This is a small sample size, but it helps to show just how effective Tippett’s system is. Based on Martin Erat’s $4.5 million salary cap hit he will need to regain his productive form or we may see a repeat of last season in Washington. While Erat’s cap hit is $4.5 million his salary number is actually lower at $2.25 million for 2014-15. He will be an unrestricted free agent after next season. Is this the last stand for Erat? This could be Erat’s last chance to show that he is still a capable NHL player. He will get the opportunity to play top six minutes next season, however the Coyotes will need to be careful not to rely on his return to form being a key driver of their sucess. By the time players reach the age of 30 many begin to decline and after 802 career NHL games equating to 223 hours or just over nine days of his lifetime he has a great deal of mileage on his body. For the Coyotes sake they will hope that he has more left in the tank to help them back to the playoffs. If not, it could be another long and disappointing season and quite possibly the end of Martin Erat’s NHL career.